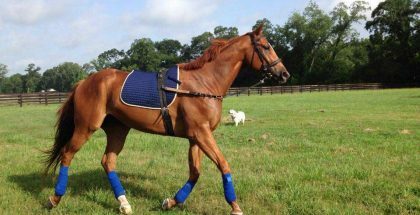 Waiting for Teddy: An OTTB Story– When a horse does not break their maiden until their 30th start, you would likely expect that horse to disappear into the dark abyss that can be the lowest ranks of the horse racing world. However, this was not the case for one lucky gelding. Casey Brister had a soft spot for the gelding, forming a close-knit bond with him. They were nearly inseparable, until the unthinkable, and nightmare, happened to Casey and Is Not. Is Not was claimed on March 6, 2014, for a rock-bottom price of $7,500 by trainer Donald Demeza. Is Not was a four-year-old when he walked through the Ocala Breeders’ Sale in Florida 2012. He sold for a low price of $12,000 to trainer Holly Harris. This is the year Casey Brister, groom and hot-walker for Holly Harris, first set eyes on the youngster. Is Not had a “pony-like” head that seemed to be characteristic for the sons and daughters of his sire. The horse debuted in a maiden claiming event in August 2012, where he finished an uneventful fourth. From there, Is Not was constantly running in maiden claiming events until he broke his long-awaited maiden, then moving into the claiming ranks, where he remained for the rest of his career. Casey went from having her best friend in the barn every morning to watching every start the gelding make on screens as small as her cell phone. However, trainer Holly Harris knew how close Is Not and Casey had become. The kind woman contacted the new trainer of Is Not and negotiated that when Is Not was ready to be retired, he could return home to Casey. 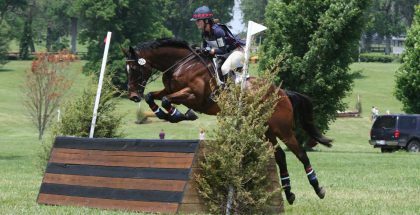 Casey admits to having ridden on and off for about seven years now and Teddy seems like the perfect horse to advance her to the next level in her skills. In November of 2015, Casey received the news that Is Not had been retired and was ready for a second career away from the racetrack. 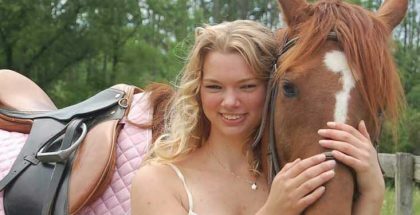 Owning a horse is a huge responsibility, as Casey already knew from being at the racetrack. She paced in her living room, mulling over the idea of owning her very own thoroughbred. After struggling with that thought, Casey made trainer Donald Demeza an offer for the gelding, which he accepted. Is Not was on a van home that night! Casey and her horse, who was more lovingly named Teddy, due to his teddy bear-like personality, were reunited. 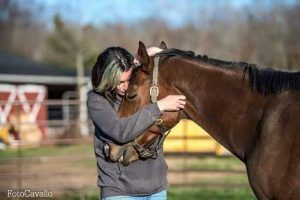 With a tear or two in her eye, Casey walked into the trailer to give her boy a hug and a kiss, all while checking the stripe down his face, making sure it was really her beloved horse. It was and now the pair could begin their lives as partners. 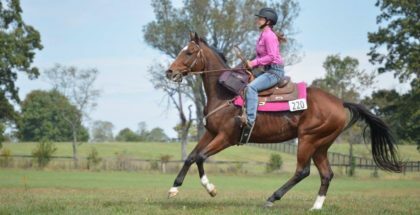 While currently still on the mend from his racing days and a still learning Casey in the saddle, the most action the pair sees is a trot and a slow lope around a round pen. 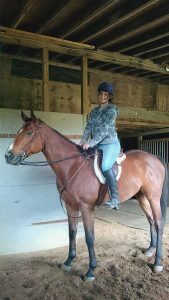 Casey admits to having ridden on and off for about seven years now and Teddy seems like the perfect horse to advance her to the next level in her skills. Casey and Teddy will likely never been in the show ring, as Casey does not have any desire to do such an activity with her companion. However, Holly Harris, while is a racehorse trainer, used to teach riding lessons, and has given Casey a lesson or two. While both horse and rider are still learning, Casey hopes to one day see Teddy as a track pony. Visit the Thoroughbred Aftercare Alliance or the Thoroughbred Retirement Foundation for additional information on Off Track Thoroughbreds.